If you are scared of creatures look the other way! 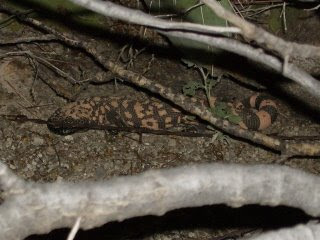 Today while I was going for a walk I saw this guy...a Gila Monster! He was just a young one, only a foot long. I had been taking pictures of my Ironwood tree but I left my camera in my RV when I went for a walk. I went all the way back to the RV, got my camera and tracked this guy down. I first saw him on the edge of the road. Now he was hiding between a creosote bush and a cactus. Gila Monsters are very cool...poisonous but cool. I saw one a couple of years ago. I'm glad they are still around. Just don't try to pick them up! 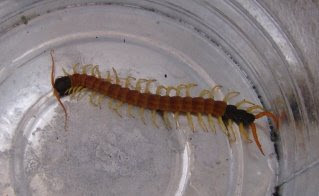 Centipedes are also poisonous. Not nearly as bad as the Gila Monster though. 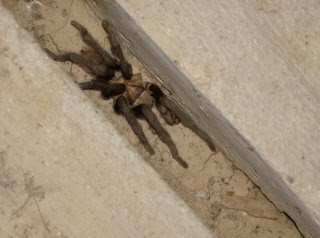 I've seen quite a few of these tarantulas lately. This one was in my garage. 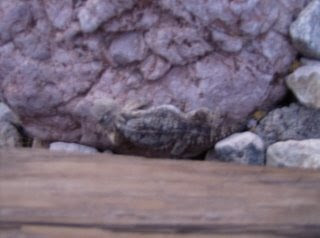 These Horned Lizards are quite abundant too. Sorry it is a bit blurry. I had one in my class when I was in kindergarten. And the most frightening of all...the glowing eyed desert devil bunny! These things are all over the place. They look cute but if you are a plant...watch out!